Annuities were pushed lower in many areas despite a significant rise in gilt yields. Some 32% of annuity rates in the market reduce with 48% remaining unchanged and only 20% increasing. The 15-year gilt yields increased from a low of 2.59% at the beginning of the month to 2.95% by the middle and despite this gain annuity rates were generally subdued with little collective upward movement, perhaps with the expectation from the providers that they would return to lower levels shortly. The reason for the rise was the Federal Reserve discounting the prospect of Quantitative Easing 3 in the US and this resulted with investors moving funds from US and UK government bonds and gilts, thereby reducing the price and increasing yields. There were more widespread decreases than increases and the decreases had larger percentages than the increases. Across the board standard annuities increased by an average of 0.35% whereas smoker annuities decreased by an average of 0.97%. Pensioners retiring with their funds remaining invested in equities have also benefited from the equities at a high with the FTSE-100 reaching 5,966 by mid March and the US Dow Jones index with a high of 13,252. This can make a significant difference to the annuity income a pensioner can receive at retirement. For more about this see timing your annuity purchase. Fig 1 shows that only 20% of annuities increased in March and of these the increase was between 0.2% and 1.2% which is quite a narrow range. The increases were for standard annuity rates and in particular Canada Life and Aviva with only slight improvements from Legal & General as they have maintained higher rates for a long period of time this year. Across the board the average increase was 0.35% all for standard pension annuities.The majority of the standard rates remained unchanged and increases were limited to male single and male joint life aged about 75 and females from 60 to 75. The decreases of 32% of the market were all from smoker annuities and in particular Liverpool Victoria reducing their rates at the end of the month. The decrease was between 0.5% and 2.8% with an average across the board of 0.97% decrease. Only those aged about 55 escaped a decrease with all other annuitants experiencing a fall in annuity rates but in particular those aged between 65 and 75. Standard annuity increases were small for each sector and the highest was 1.2% for females aged 70, single life with 3% escalation and for smoker annuitants all the sectors decreased on average although not for those aged 55 to 60. The largest decrease was for 50% joint life annuitants aged 70, level that decreased by 2.2% and the 3% escalation which decreased by 2.84%. The majority of the decreases were between 1.0% and 1.6% which indicates a more aggressive reduction in rates as a whole but particularly for smokers. Annuity rates are heavily influenced by the 15-year gilt yields as these are used to fund the income payments to annuitants. Over a month gilt yields have increased by 13 basis points and this would suggest that annuity rates should increase by 1.3%. In fact standard annuities have increased by 0.35% and smoker annuities have decreased by 0.97%. This means at the end of March standard pension annuities had the potential to increase by a further 0.95% and smoker annuities by 2.27%. Looking at the comparison over a longer period of time of three months, standard annuity rates have increased by 0.89% and smoker pension annuities have decreased by 1.16%. This means at the end of March standard annuities had the potential to increase by a further 1.71% and smoker annuity rates by 3.76%. 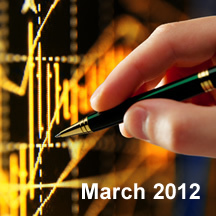 For the latest updates see Annuity Rates 2012. This implies the providers are being cautious with increasing rates expecting gilt yields to fall and in the mean time improving their profitability with greater margins. Impaired annuities are experiences a volatile period and although they have increased this month there have also been some significant decreases in March. This has occurred as providers have optimised their pricing of annuity rates so resulting in some annuities for certain medical conditions decreasing by 3% and in some cases as much as 15% from Partnership Assurance.